Oreo India is promoting their new Strawberry Crème biscuit variant with a #chocopink moments campaign on their owned digital platforms. As a part of the campaign, users get to share memorable moments from their life that have a hint of pink and chocolate on the Chocopink promo site. Participants can log in via Twitter or Facebook, share their pictures and also get friends to vote for their entries. The best moments go up on the Oreo Wall and on the Oreo India Facebook Page. The ‘share your special moments’ premise is a favourite with most advertisers and simplest to execute, so there is nothing new here. The promo site is very basic in layout and fails to render well on some browsers. 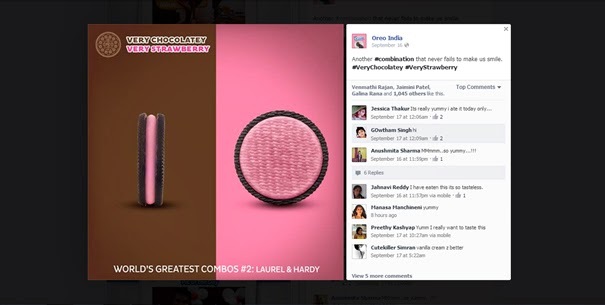 Oreo used a striking Facebook logout banner to draw attention to this campaign. The topical and smart imagery Oreo creates with its biscuits are the high-points on their Facebook page.